After a mostly pleasant holiday weekend, a cold front came plowing through on Sunday and has brought us back to early winter as we start a new week. The good news is that it won’t be too cold for too long, nor will we have a lot of significant weather to discuss this week. Let’s get into the details. We’re starting off chilly this morning. We didn’t drop below the mid-60s on Sunday morning. But this morning, temperatures running a good 20 degrees or more colder than 24 hours ago. It will eventually be a nice day today, albeit cool and breezy still. There’s an area of cloud cover that will be moving through the region this morning. It could perhaps have some showers or light rain with it as it passes through. Once this passes by, we’ll see clearing this afternoon. So we’ll call it mostly cloudy with a chance of showers through about midday, then becoming mostly sunny. Winds will gradually subside through the afternoon. As long as skies clear out around midday, we should manage 50 degrees or lower-50s. If we stay locked in cloud cover into mid-afternoon, look for a struggle through the upper-40s. Clearer skies and lighter winds tonight will make it the coldest of the next several. 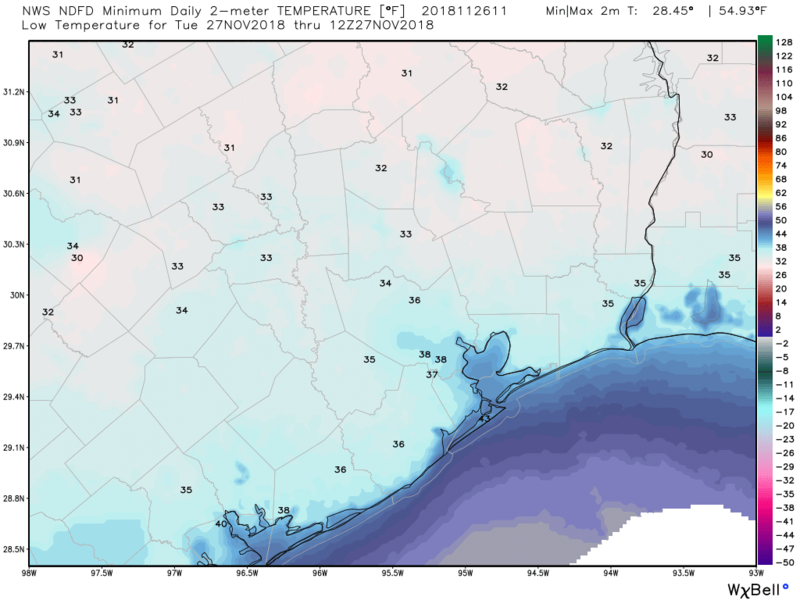 Low temperatures will range from the low-30s north of Houston to the mid-to upper-30s in town and low-40s along the coast. A light freeze is possible for places like Conroe or Huntsville tonight. Look for another cool day Tuesday but with less wind and plenty of sunshine. We’ll do a few degrees warmer tomorrow than today, with highs topping off in the upper-50s. Good morning! Whether you’ve been up all night shopping, up all night waiting on shoppers, or you sensibly just slept off a tryptophan high, welcome to the day after Thanksgiving. We’re now in the midst of the holidays, and our weather will get off to a good start. We’ll have a seasonably warm weekend, and then winter-like weather during the week ahead. We should remain sunny for most of that period. A low-pressure system along the coast and an onshore flow will combine to bring some lower-end rain chances into the region today—probably no more than 20 to 30 percent. These showers will move east by around noon or shortly thereafter, and accumulations shouldn’t be much to write home about. Mostly cloudy skies will limit highs to around 70 degrees. A weak front will arrive later this evening, or tonight, but the atmospheric profile does not favor any additional rain with this front, and it just should bring a wind shift (from the north) into Saturday morning. This still looks like a great day for anything you have planned outdoors. Friday night’s front will eventually wash out, but it should bring enough dry air to make for a pleasant, not too humid day in the mid-70s, with mostly sunny skies. On the day before Thanksgiving, Matt and I just wanted to share our appreciation for our readers. When this site started in 2015, it was little more than a hobby. 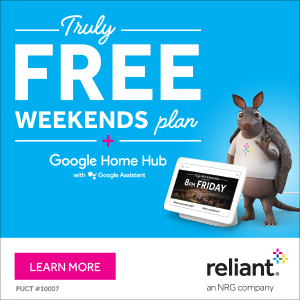 But now, three years later, we’ve been made to feel like full-fledged members of the greater Houston community. This has been a wonderful ride to be a part of, and it all begins with the kind words and enthusiasm of our readers. Thank you! It’s a chilly start to the day, with lows generally in the 40s across the metro area. With partly to mostly sunny skies, we’ll see highs push up to around 60 degrees. A low-pressure system in northern Mexico and South Texas will bring some rain chances (likely around 50 percent) into the forecast this afternoon, and evening, but the system looks to remain far enough offshore that most of the heavy precipitation should stay there. Coastal areas will see the best chance of rain, but even there we’ll probably measure accumulations in tenths of an inch. Some rain chances may linger from midnight into the wee hours of Thanksgiving, but as the low moves east, any rainfall should go with it. This will leave us with what should be a really nice Thanksgiving day. I’m looking for highs in the low- to mid-60s, with partly to mostly sunny skies. Mother Nature will provide us with, dare I say, a cornucopia of good weather? 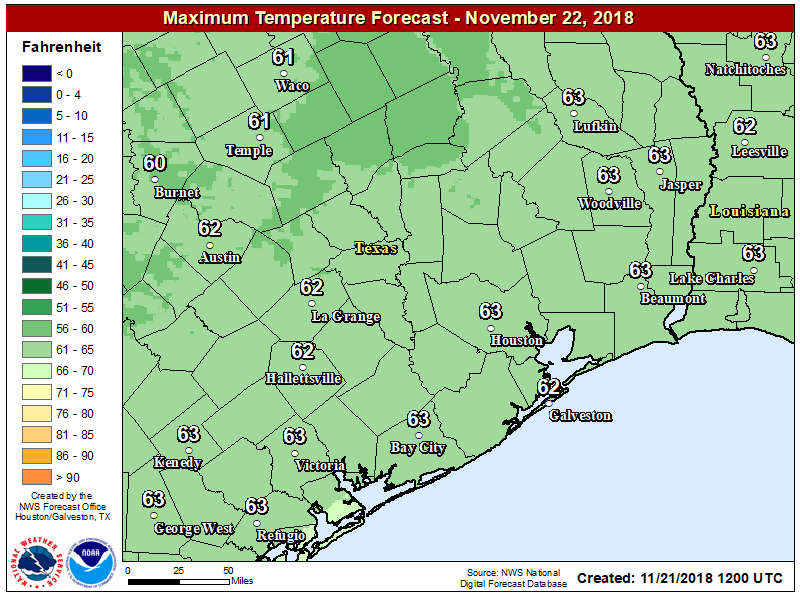 Well, we sure didn’t start the holiday week on a bright and cheerful note, as Monday was a December or January-like gray Southeast Texas day. We will have a much brighter day today before we head into the holiday weekend with some low-impact unsettled weather to discuss post-Thanksgiving. Skies have mostly cleared out across the area, with the exception of a few spots south of I-10, as of about 5:30 AM. Expect those locations to clear out also, and we’ll have a mix of sun and just a few clouds in the area today. It will feel world’s warmer versus yesterday. Monday struggled to hit 50°, but today we should have no issues getting into the low-60s for high temperatures. Clear skies will continue tonight. 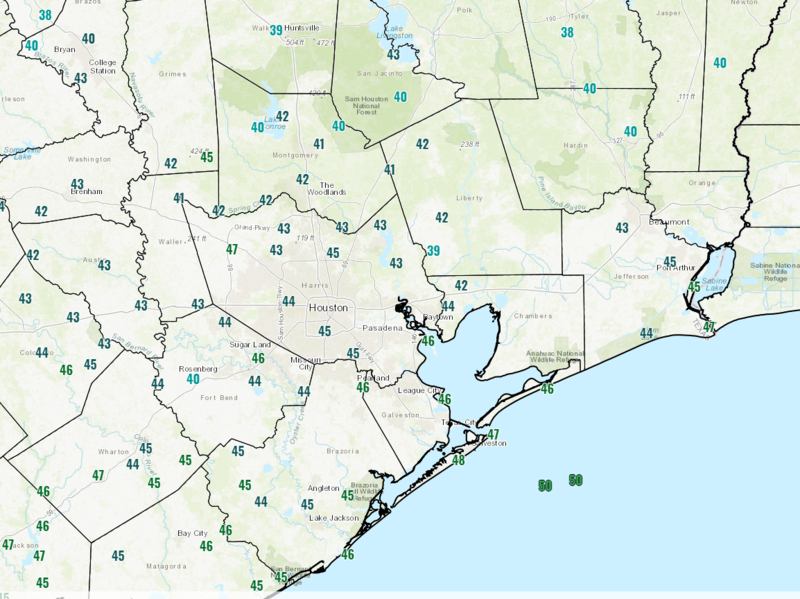 Look for overnight lows to range from the low-40s northwest of Houston to the mid-40s in Houston and the upper-40s southeast of town. The good news: If you’re traveling around the region on Wednesday, it should be mostly uneventful. There will be some low clouds or light rain and drizzle that materializes in the afternoon, mainly in East Texas. 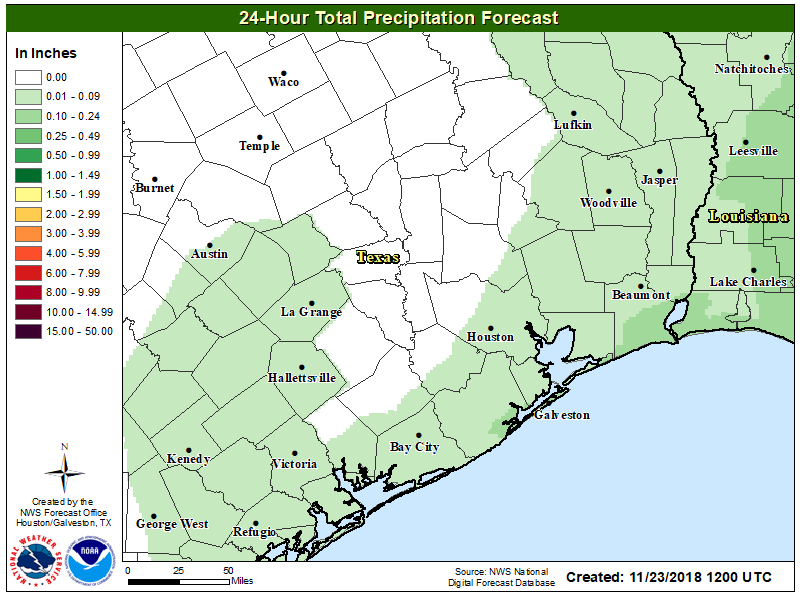 So just be prepared for some wet roads if traveling anywhere from Houston late. But any meaningfully significant rain will develop overnight and mainly over the open offshore waters of the Gulf of Mexico or east into Louisiana. If you’ll be traveling outside of the region on Wednesday, there shouldn’t be a ton of issues to deal with. There will be snow showers and some gusty winds in the Northeast, so if you’re flying toward New England or the New York City airports, that could give you a delay. 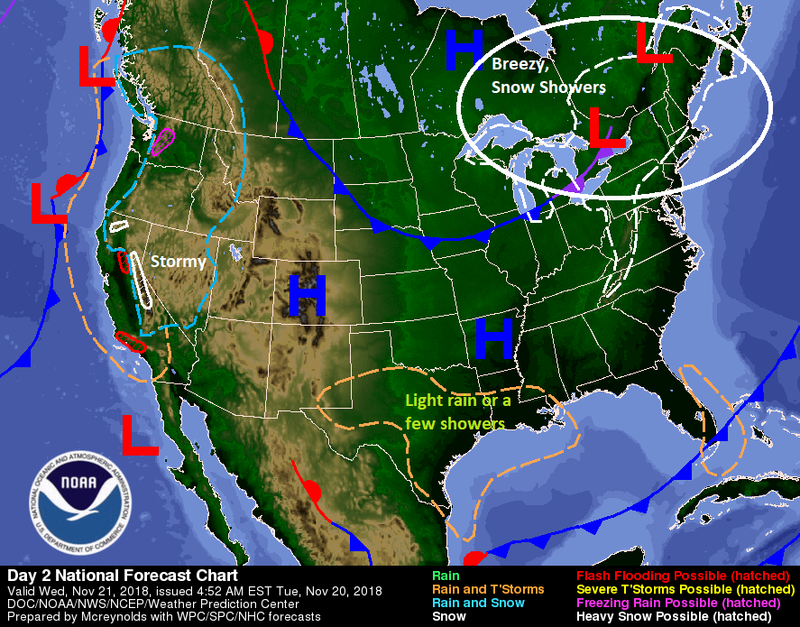 Atlanta and Chicago both look good Wednesday, so a couple trouble-free hubs will help matters. There will be no issues in Denver, but a storm bringing much needed rains to California may cause some issues at San Francisco or Sacramento. Overall, this is an acceptable travel day forecast. Bringing it back locally, we’ll see clouds gradually increase during the daytime. Some light rain, drizzle, or a few showers may develop toward evening and that would continue into Wednesday night.